Making French Macarons has been in my to-try list since I started blogging...but I've read so much about how finicky it is to make. I even remember reading in one article that "making French Macarons takes skill and is not advised for novice bakers". That intimidated me and I decided to just set aside my dream of being able to serve my daughters homemade French Macarons. I was already contented of just buying these treats from a nearby store at $1.50 per small piece (1 inch in diameter) or $12 per dozen...and I never thought I would ever dare to try making them myself! Thanks to my friends at Baking Partners, especially to Vidhya of A Portion to Share and Swathi of Zesty South Indian Kitchen who chose the theme for this month's challenge. Because of them, I was inspired to turn a long time dream into a reality...and now I know that making French Macarons at home is totally do-able and actually not that hard! 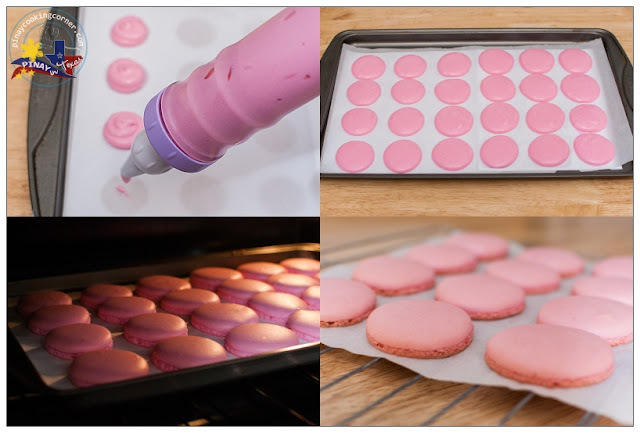 The troubleshooting guide from Foodnouveau and howtocookthat's YouTube video provided me everything a first timer French Macaron baker should know! I followed a simple French Macaron recipe from Martha Stewart which only requires a few ingredients. I couldn't find almond flour so I decided to just make use of blanched slivered almonds and ground them myself. 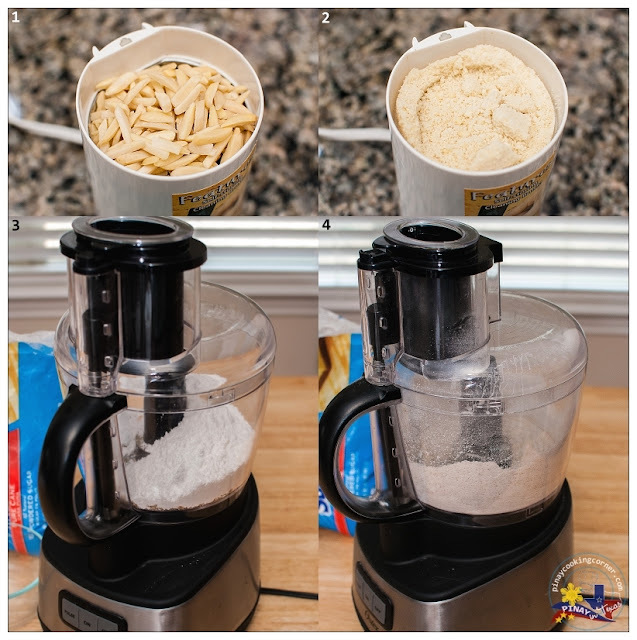 I've read before that grinding blanched almonds in a food processor won't work. They need to be ground in a special way that prevents them from becoming oily, so I thought I'd use a coffee grinder. Well, it worked well for me. All the tutorials I've read suggested that to be more accurate, weighing the ingredients is better compared to just measuring them in cups. I stick to using cups though, but I see to it that everything is exactly measured. I must say that I really had a great first time experience in making French Macarons, and I've learned that if you just measure everything accurately and not over beat the meringue nor over mixed the batter, even the most novice baker can make good French Macarons! The only difficulty I had was shaping them into equal sizes. I even printed templates for 1 inch circles and put them between the cookie sheet and the non-stick parchment paper that I lined it with...but my macs still came out in different sizes. :) Oh well, you can't expect much from a first timer, right? But my daughters said my macs tasted a lot better compared to these ones they usually eat. 1. If grinding blanched slivered almonds like I did, be sure to grind them finely then sift it twice. 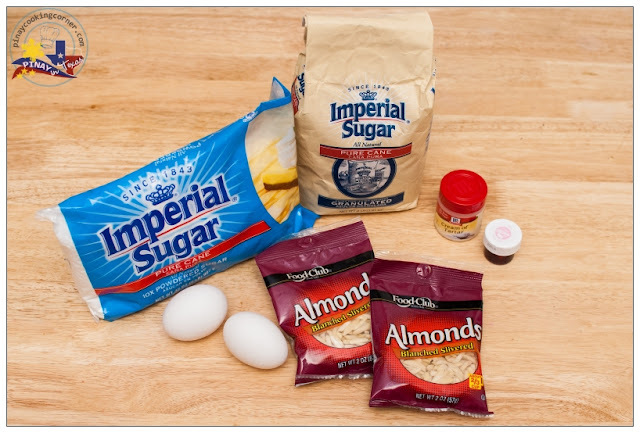 Pulse confectioners' sugar and almond flour (or finely ground almonds) in a food processor until combined. Sift mixture 2 times. 2. Preheat oven to 375 degrees. Whisk whites with a mixer on medium speed until foamy. Add cream of tartar, and whisk until soft peaks form. Reduce speed to low, then add superfine sugar. 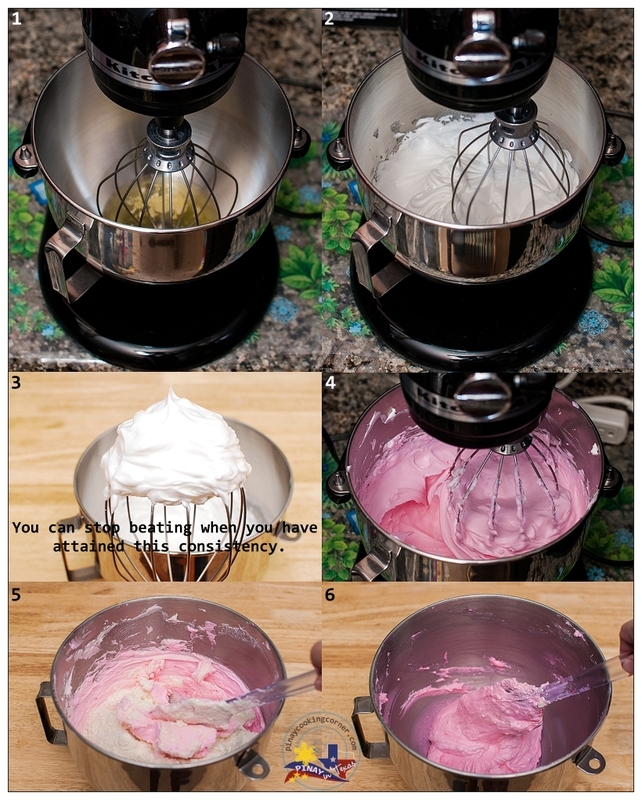 Increase speed to high, and whisk until stiff peaks form, about 8 minutes. Add gel food color and continue mixing for 1 more minute. Sift flour mixture over whites, and fold until mixture is smooth and shiny. 4. 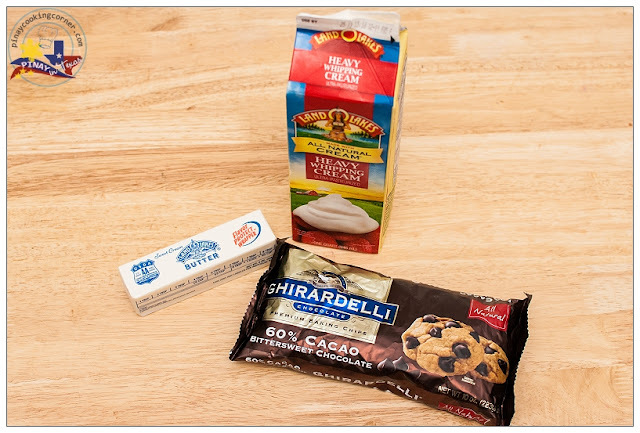 Prepare the chocolate ganache. Bring cream to a boil in a saucepan over medium-high heat. 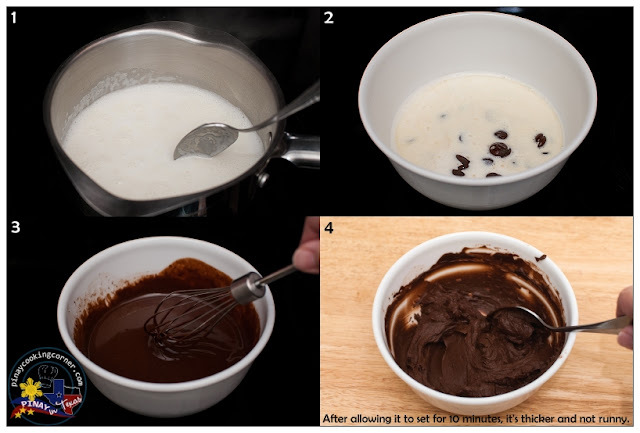 Pour cream over chocolate in a heatproof bowl. Let stand for 2 minutes. Add butter, then whisk mixture until smooth. Let cool, stirring often. Allow to set for about 10 minutes before using as filling. 5. Sandwich 2 same-size macarons with 1 teaspoon filling. Serve immediately, or stack between layers of parchment, wrap in plastic, and freeze for up to 3 months. 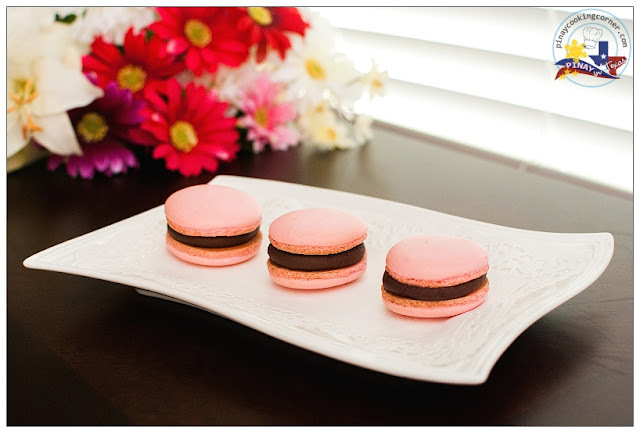 Check out what other Baking Partners members have shared on French Macarons! I'm sure you'll learn a lot from them! I agree with you. I was scared and I think that after reading and learning the process it is not as difficult. Your macs look delicious and hope you've enjoyed the experience as much as me. Lipsmacking good French macarons. Love the chocolate ganache piping out from it. Oh Tina ! 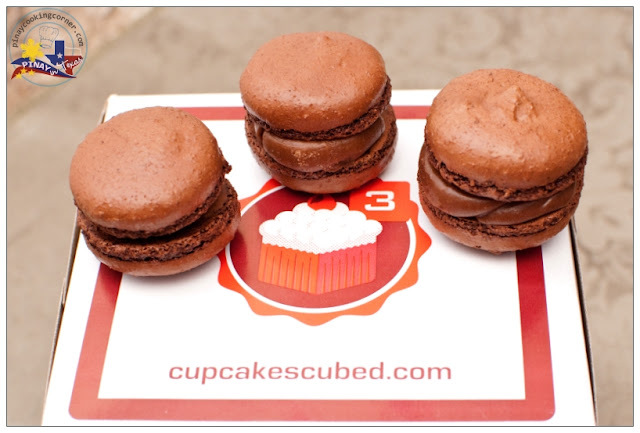 Your macs look spectacular and I bet delectable as well ! Your right re price :P I have yet to try Ladurée macs here , it's HK $ 23. each tsk tsk ....I'm already on my 8th feetless macs *sigh* :D I'll begin my 9th attempt if I'm not too lazy , hopefully with feet this time lol Wish me luck ! Macarons looks absolutely delicious,was a great learning experience,you did a great job Tina,it is lovely! Lovely macarons dear,love the way you have presented them!! Amazing macarons, I think it's time i make some. Oh wow! 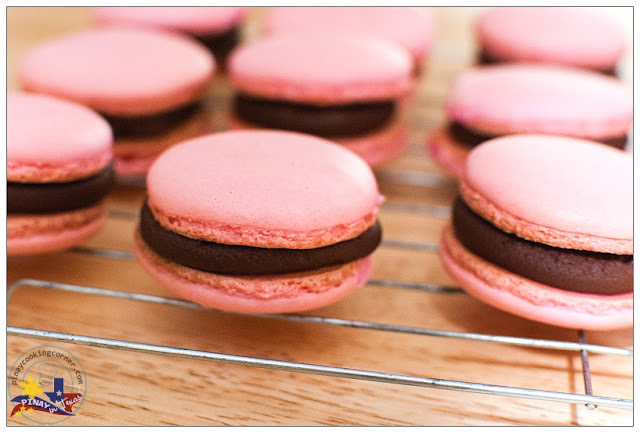 These macarons look so wonderful, pink and brown looks lovely! OMG!!! These look super perfect!!! I have this motto for you Tina which goes like "You can do it when its baking". Even being the first time, an amazing outcome and high praises, what more seeing the pics. I shall just stand by and watch all the lovely desserts and cookies you make. Hi Tina! 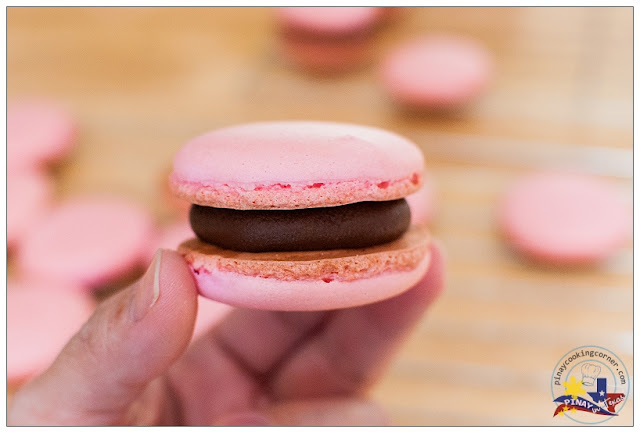 Your macarons are perfect, certainly not a novice' creation. I haven't had much success with macarons so probably, if I decide to try again, I will use your recipe. Your daughters have given you the best compliment!! They look so pretty and professional! very innovative n nice cliks dear.. They look very pretty! Tina the almond flour they sell here is made of blanched almonds. When I need almond flour I grind whole almonds. Hi Tina, your mac look so good, very pretty and cute. Beautiful Tina, you did very well, love both version of macarons, I need to try chocolate version. Yumm. You have done it perfectly.Beautiful pictures. Your Macarons looks beautiful and attractive..Love the colour combo too.. 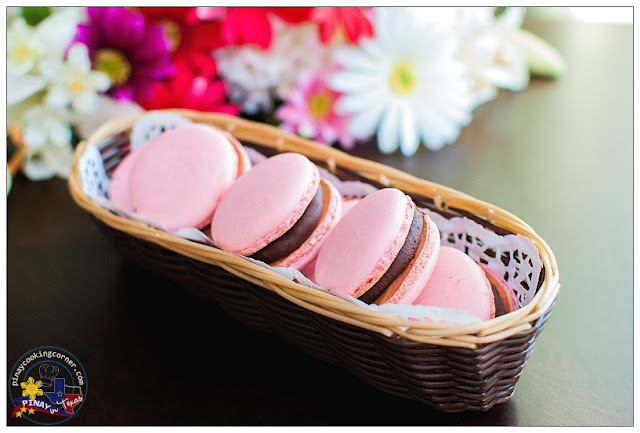 Awesome looking macrons and beautiful color...Nice detailed post Tina.. I agree, they're not as intimidating as they seem right? And the toughest part really is piping perfect circles. im looking forwaed to make this recipe. its looks so yummy. Wow, what a nice post ! This French Macarons looks awesome. Thanks for sharing nice recipe with us. I will try this at home. I like french food very much and i have tried many french recipes which i got from youtube and many other website. I like visiting French restaurants in weekend.